"Hi! I'm Teacher Zulein and I'm here to help you achieve the score you need for your IELTS exam. I'm currently a Law student at Central Philippine University. I've also been teaching English for so many years now! I'm particular with grammar and pronunciation, but I also create a friendly environment for class. With my experience, I can be flexible and adjust to your speed and mastery of the English language. I tailor different systems and techniques for every class so that we can effectively develop your strengths and work on your weaknesses. I also like giving tips to my students from my experiences which can help them develop confidence and think quickly when answering IELTS questions. I've also been trained by an IELTS examiner courtesy of Super English. Aside from that, I can assure a fun teaching environment which you can look forward to every day! See you!" Hello! This is T. Aikko. I am an avid music lover and an extreme adventure seeker. Most of the people who know me would deem me eccentric. Students tend to be petrified by the thought of IELTS but I am here to show you that IELTS can be a friend. Our classes will be about identifying and eradicating your IELTS related fears and weaknesses. I believe that determination can take a person very far. I desire nothing more than to see my students achieve their dreams and careers. As an optimist, I choose to always look at the positive side of things and of people. I consider it my responsibility to make a difference in the life of my students so if you would give me this chance to be your teacher, that is what I want to achieve. 싱가폴 영어교사 출신 애플 선생님입니다. 와이지 선생님과 슈잉 정기평가 1, 2위를 다투시는 애플 선생님! 평가 14년의 교육경력만큼 정말 선생님답다!라는 칭찬이 자자하십니다. 굉장히 유능한 논술 선생님 같은 느낌이라는 평이 많습니다. 왜 그렇게 작성한것인지 의미를 물어보시고 앞뒤가 잘 맞게 변경해주십니다. 답변을 구성할 수 있도록 해주십니다. 발음도 좋으시고 많은 표현을 가르쳐주십니다. 항상 스케쥴은 꽉 차고도 오버되어있습니다. 자리가 난다면 놓치지 마시길 추천드립니다. My students call me Apple and I have 14 years of experience in the teaching industry. My energy and passion in teaching, combined with patience and flexibility, ensure the best possible quality education for students. I believe that all students can learn and that methodologies and teaching styles can be differentiated to better suit the learners. Learning English would be a breeze and with dedication, we can work together towards your desired IELTS band score. 학생분들이 다 좋아해요! 라는 평으로 설명되는 덴 선생님입니다. 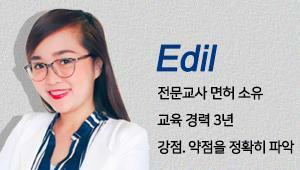 슈잉과 함께한 시간 3년차이며 인기 만점인 만큼 항상 수업은 Full 입니다. 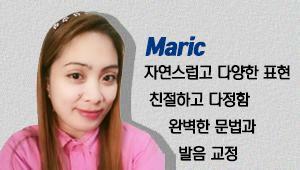 수업자리가 나면 꼭 들어가시길 추천드립니다. 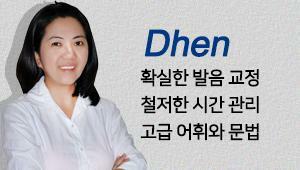 My name is Dhen and I have been teaching English for more than 3 years now, both online and offline. It is my passion to educate, guide and help learners as they aspire to achieve their dreams. I would love to share my knowledge and skills to assist every student towards their growth and development in the target language. 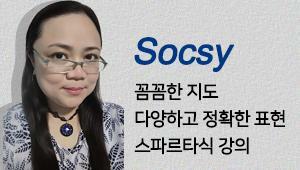 류선영 5개월 정도 선생님과 수업 했습니다. 아이엘츠는 3개월 반 하고 졸업했는데 생활회화 공부하고 싶어서 더 했어요. 시간에 철저하시고 오히려 오버타임으로 해주세요. 어휘도 풍부하시고 포인트를 잘 짚어주셔서 좋았습니다. 친화력 4로 되어있는데 절대 아니고요 제가 볼 땐 5에요. Hello. I’m teacher Edil and I’m here to help you in choosing the best IELTS online review center. Are you afraid and stress of failing the test? Do you have the fear of failing it? I know that you need the best IELTS online review training program that will develop your speaking and writing skills which are suited for IELTS examination. Well, Super English offers IELTS review that will prepare you to take IELTS with confidence and I will be your partner in you IELTS journey. Here are the reasons why you should choose me as your IELTS teacher. I achieve overall band score of 8 in IELTS examination. In addition, Super English provided an excellent training in IELTS and it was conducted by a British IELTS examiner. I also have my specialization in English with my license as a Professional Teacher. I also have training in English Proficiency conducted by TESDA. I had also more than three years of English Language and Literature teaching experience. Over the past year, I had the opportunity to teach beginner to intermediate learners. This involved in actual facilitation learning in various courses such Structures and Grammar, Linguistics, Afro-Asian Literature, World Literature, Reading and Writing Skills. Through this experience, I have demonstrated my ability to work independently and productively as well as become valued team leader as an English teacher. Furthermore, during my college days I awarded as College Scholar and Dean’s Lister several times. I hope I will demonstrate it in our class and help you using my ability to teach you at your satisfaction. As you IELTS teacher, I will help you to the exam. Expect in the class that we will identify your strengths and weaknesses. After finding those things I will help you step by step until you are confident and knowledgeable enough to take the exam. For example, in my speaking classyou will practice to speak fluently with only rare repetition or self-correction. In addition, you will deepen your knowledge in vocabulary with flexibility and precision in the entire given topic. Off course, you will know how to use properly the full range of structures and pronunciation naturally and appropriately. I hope to see you soon in my class and thank you for choosing me. In years of teaching English and through trainings provided by our company, I formulated easier and faster way to learn about IELTS. 1. Get familiar with the RULES of specific ILETS exam. -In every exam, there is a rule. This includes the instruction and the time limit for every part of the exam. Remember following instructions is crucial so keep those in mind always. 2. Studying is really important, this includes the technicality of grammar, vocabulary, pronunciation, fluency and coherence. -Technicality is very important to achieve higher bands in IELTS, so it is really significant for us to dwell on these factors. 2. Don’t Hesitate to express your opinions or ask your queries. -In IELTS, because we are expectant of the advanced level learners, materials are also unconventional. Thus, there are instances that you will find difficult to comprehend due to teacher is speaking too fast that you didn’t get the grasp of what he/she meant or because of some hifalutin words and opaque statement, never ever get intimidated because we are here to help you not to criticize you. There is a popular cliché that talks about “A man who asks question is a fool for 5 seconds, but a man who never asks questions will remain fool forever”. We are like hot air balloon, we are not functional once empty. How can we improve if we are not willing to learn? I need you to be open minded in learning, so we can together achieve what you want to aim. - Knowledge is of no value unless you put it into practice. Once you learned the IELTS strategies, rules and knowledge, it is very important to apply them because IELTS speaking, writing, reading and listening is very helpful in dealing with day to day activities wherever and whenever you are. IELTS exam is very diverse and thus this can also benefit you in transacting with various nationalities. Given are simplified IELTS strategies that can apply whether in speaking, writing etc. Hi! 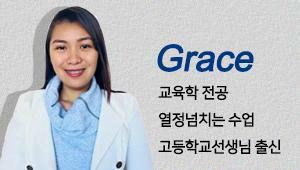 I'm Teacher Grace. A graduate of Bachelor of Secondary Education. 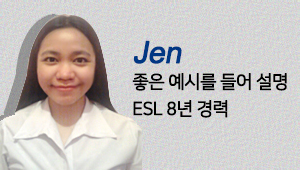 A licensed Professional teacher and a Certified English Language Proficient. I've been in the teaching industry for many years now, and I am very flexible for change. With all my experiences of teaching in High School and one on one English tutorial, I can get along easily with a highly diverse students, with different needs and capabilities. Teaching is my passion, and for me it must include consistency and hard work in every class, in able for the students to learn. Here in Super English we're trained by a Certified IELTS examiner and equipped with all the materials you needed. I have been working in the hospitality industry for more than 8 years and with this I have gained a lot of experiences that helped me developed my skills and grow more as a professional and as an individual. I am an efficient and effective worker who can deliver an excellent result. 자신감이 필요하신 분들께 큰 도움이 됩니다. 즐겁게 수업에 임할 수 있도록 이끌어주시는 스타일입니다. Hi! My name is Jen. 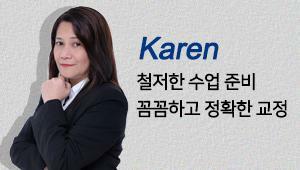 I've been teaching ESL to Korean learners -children and adults- for several years. I truly enjoy teaching English. It is my passion! I take pleasure in sharing my knowledge to English learners. 김나리 친화력에 별이 왜 4개인지 모르겠어요 ㅠ ㅠ. 자신감이 필요한 학생들은 Jen선생님 강추입니다! 첫수업 때 생기발랄한 리액션에 감탄했어요...그냥 paragraph만 읽어도 Thank you for your reading! Good job~ 이런 리액션에 좀 당황스럽긴 했지만 저도모르게 자신감이 생기더라고요 . 앞으로 쭈욱~ 수업하면서 롸이팅 성적도 쭉쭉 오르길 기대해봅니다.! 알아 들을 수 있게 쉽게 설명해주시고 한국어를 못하시는데도 불구하고 제가 뭘 말하고 싶어하는지 금방 알아내시고 좋은 영어 표현을 알려주십니다. 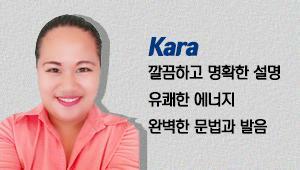 I have been teaching English to Korean students for almost eighteen years now. My way of teaching revolves around writing, grammar, vocabulary, pronunciation, and listening. While I was working as an ESL instructor, my tasks involved planning, preparing and delivering lessons to a range of classes and age groups. I also prepared and set tests, examination papers and exercises not only to students but my fellow co-teachers as well. Moreover, I have written two grammar books, focusing on Verb Tenses and Sentence Construction for speaking and writing. Hi there! 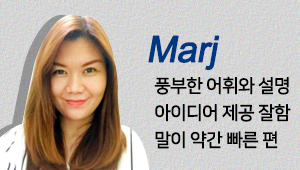 Teacher Marj is what my students call me. 2004 is the year that I realized teaching brings forth satisfaction in my life. Thirteen years has passed but my passion for teaching hasn't fizzled as teaching is what I do best, so looking forward to seeing the success of my students in their chosen field with my help . 크리스티 선생님은 영문학 학사 그리고 영어언어학 석사이시며 현직 대학교 강사입니다. 열정과 에너지가 넘치는 아이엘츠 수업을 제공합니다. 수강생분의 답변을 꼼꼼하게 살펴보시고 자세한 교정을 해주십니다. I am highly professional, result driven teacher. I have a ten year experience teaching English as a second language to a wide variety of students encompassing diverse backgrounds and learning needs. I have a degree in Bachelor of Arts in English major in Linguistics, Mass Media and Literature. I have also completed all academic requirements for a degree in Masters of English in Applied Linguistics. 아이엘츠 초보부터 고득점까지 베니선생님은 항상 수업만족!입니다. 여러분의 아이엘츠 스피킹과 라이팅을 교정해주십니다. 깨끗한 발음으로 주제에 맞는 용어와 표현들 예시들을 친절하게 설명해드립니다. 토픽과 관련된 용어와 표현, 예시 상황들을 친절하게 설명해주십니다. 인기에 걸맞게 항상 풀 스케쥴이며 자리가 나자마자 기존수강생들이 연장하는 인기최고 베니선생님을 추천합니다. Hello and good day! My name is Venie. I studied engineering and worked too as an engineer for two companies. Currently, I am enjoying my role as a stay-at-home mother for my young daughter. Aside from being a mom, I enjoy learning about physics, positive psychology, meditation and other non-conventional knowledge. Learning has been a very important part of my life. I sincerely hope that I can be a part of your learning experience and help you achieve your goals for studying the English Language. Looking forward to learning with you! 에너지가 넘치고 밝으신 리즈 선생님 입니다. 단단하게 잡아주셔서 초보자가 기틀을 잡는데 도움이 많이 됩니다. 또한 학생의 말에 굉장히 집중해주십니다. 성적향상 케이스도 많고 만족도도 높답니다. 영어의 기본기를 다지고 스피킹의 유창성을 높이고 싶은 분께 강력 추천합니다. 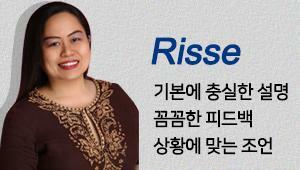 My name is Risse. I’ve been teaching English since 2009. I also manage a business in the wellness industry, as I always find passion in helping others. Why do we need to learn English? We have a natural thirst to be able to communicate and interact with people of any race or culture without stumbling for words, getting nervous, right? We apply a very effective approach to learning so that you know how to speak well like a native speaker. Don’t worry you will learn it too. I'm looking forward to meeting you soon! 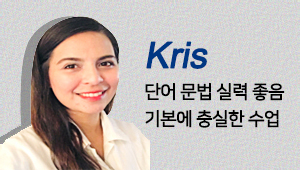 우선.처음 스피킹을 준비하는데 함께 공부하면 좋은 프로그램인 것 같다. 어떤 유형의 어떤 질문으로 시험이 나올지 몰랐고, 또한 그 질문에 답변을 제대로 하고 있는 것인지 어느정도 평가가 필요했는데, 외국인 선생님께서 그런것 하나하나 잘 잡아주셔서 좋은 프로그램인 것 같다. 또한, 선생님들마다 가르치는 스타일이나, 방법이 달라서 기회가 된다면 두 선생님으로 하는것도 나쁘지 않은 것 같다. 한달동안 많은 향상을 바라는건 큰 욕심이었지만, 그래도 처음에 um... um...만 하다가 끝난 내가 기본 2-3줄의 말은 하는 것 같아서 효과는 있는 것 같다. 물론. 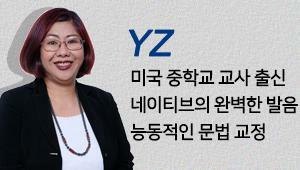 한달 더 연장해서 복습도 더 열심히하고 시험 점수를 얼른 따야겠다. * Risee 스파르타식이며, 내가 질문에 대답을 못하면..할때까지 기다려주시며, 좀더 높은 점수대를 원하시는 분들이 하시기에 괜찮은 것 같다. I am Anna Carmela Beatrice Nieva but you can call me Kara for short. I love watching cartoons and coloring books during my free time. I love teaching. It is my passion to educate young minds. It gives me a great fulfillment whenever students learn from me. I do believe that you can achieve anything you want, if you put your heart and mind to it. Teacher Certificate Program - PHINMA University of Iloilo"
"Hi, I'm Teacher Vivienne of Superenglish. I have a bachelor’s degree in Arts, major in Mass Communication. During my university years, I was awarded as one of the outstanding students in my city. I recently pursued my teaching career by taking up the recently held licensure exam for teachers after acquiring some educational units in a university.I have been an ESL teacher for more than a year now. In my experience, I learned that it is easier for my students to learn if I relate the lesson to their personal experiences. Outside work, I spend my free time doing volunteer activities and outreach program for the less fortunate people. I also enjoy watching movies and documentaries. I also delight myself in reading novels. " I have been teaching for several years now. I believe that I'm very personable in front of every students or new people that I meet. I love to get my student involve and engaged. I can also adjust to different levels of student hence I am patient and well prepared no matter what situation. The reason why I make this as my career is that I love educating people. I like meeting new students. I embrace every day of my life as a teacher. I am trained and have the full capacity to teach student of all ages and students coming from different level of English. My name is Teacher Julienne of Super IELTS. I have a bachelor’s degree in Arts, Major in Political Science and currently pursuing my Juris Doctor degree in Central Philippine University, College of Law. I also have acquired my TESOL Certificate at West Visayas State University- Center for Foreign Languages so I could effectively teach English to ESL learners. I would love to seize this opportunity to teach and help you more about the English language. My primordial goal is to guide you on how to successfully pass the IELTS exam. Teaching has always been my passion. 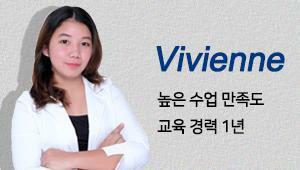 I have been teaching English for 4 years and have taught Koreans and Chinese students of different age, both offline and online in a professional and compassionate way. I specialized in reading comprehension and conversational English. I also coached Korean students’ in preparation for their Job Interviews, OPIC exams and TOEFL exams. I can assure you that in my class, you can have the quality education that you always wanted. Learning is an endless process. Hence, have the privilege to learn because regardless of the age and gap, as long as you have the desire to learning, you are entitled to it. I am very much excited to see you in my class so that together, you and I will learn. Saying welcome you in advance and best regards. me as your teacher for your IELTS preparation. I'll start by introducing myself. My major is Travel Management. I've been an ESL online teacher for more than 3 years now. 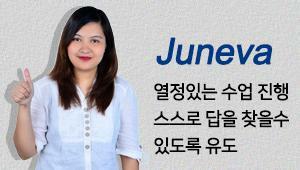 I've helped Korean students enhance their speaking and writing skills in English. I am delighted to say that Super English has provided me an IELTS training from an excellent IELTS examiner.As a tutor, it has helped me a lot for my IELTS growth and development which I could utilize for my students in their learning and guarantee them for their IELTS test. So, why should you choose me? First, you will be pleased with my energetic and outgoing personality. I am superb when it comes to motivating my students. Second, you will be expecting me to make corrections, encourage your responses and ensure that you are proficient in English for IELTS. You may expect me to complete tasks outside of lessons, such as writing lesson summaries, sending you corrections by email and setting you homework. writing test using the IELTS evaluation method. Only SUPER ENGLISH offers you IELTS preparation programs that would assuredly and attain the language proficiency that you hope for, we provide you specialized classes that are suitable for your IELTS needs. And overall, we make sure that the experience of learning that we provided to students have made a substantial impact to their IELTS achievement. 자이라 선생님은 슈잉에서 영입한 보석같은 인재랍니다. 데모클래스 참여자들의 극찬을 받으며 수업오픈지 2-3일만에 풀스케쥴을 마감하셨습니다. 수강생의 의도를 이해하고 더욱 풍부한 답변으로 만들 수 있습니다. 아이엘츠 초보 수강생의 만족도 100%를 자랑합니다. 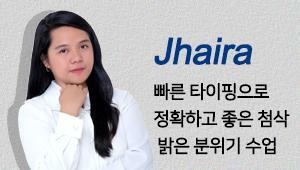 Hello everyone, I'm Teacher Jhaira! Teaching English is one of the things I enjoyed the most. I have been teaching English in several online academies for more than four years. My lessons focus on three core areas: Speaking confidently, improving accuracy, and communicating effectively. From the first day, the focus will be on YOU and YOUR GOALS. We'll make a plan to see that you reach them. Each lesson will provide lots of chances to practice all the new things you will learn. 발음도 좋으시고 아이엘츠 베테랑 선생님입니다. 아이엘츠 초보부터 고득점 라이팅까지 두루두루 최고의 선생님입니다. 아이엘츠 시험관의 극찬을 받은 쉬나 선생님! 완전히 영입하기까지 저도 많은 심혈을 기울였답니다. Hi my name is Sheena. I have several teaching experiences. After I graduated from the university. I worked with American and British companies for more than 10 years as an English and Products Trainer. Currently I am an assistant manager in Business. I work with people from China, Australia, Taiwan and Korea on a daily basis. I am passionate about teaching, travel, social media, sports, TV and entertainment, make up and a lot more When I'm not teaching or planning awesome things for my students and my class... I enjoy reading, shopping, dining - out and spending time with dear family and friends. Thank you so much for your time and I look forward to working with you. 이 한 마디가 모든것을 말해주는 인기최고 마릭 선생님입니다. 이끌어 주면서 아이엘츠 스피킹과 라이팅 평가기준에 맞는 교정을 제공합니다. Hello everyone, I'm Teacher Maric,I've been teaching for a few years now and I've come across people with different levels of English communication skills. Thus,teaching English is one of the things I loved the most. It cannot only give me the opportunity to impart my knowledge to others but also enjoy knowing somebody’s culture . I believe that more chances of a student to speak up in the class is the foremost and effective way to learn since an opportunity to be heard and be corrected are their primary goals of taking classes. In addition ,its not only about lecturing but rather pondering effective strategy to let students ability be practiced and improved. Furthermore, I do believe that everyone can learn and speak English with fun too!. 현직 대학교의 교수님이셔서 이른 아침과 늦은 밤시간의 수업을 맡아주십니다. 베테랑 아이엘츠 선생님이구나!하는 경험을 하실 수 있습니다. 답변의 중요 포인트를 잘 집어주시고 파트별 주의점을 반복 상기시켜주십니다. 수강생 스스로 현재 실력을 잘 파악할 수 있도록 지도해주십니다. 아이엘츠 시험의 평가기준에 맞게 문장을 구성하고 표현을 수정합니다. 수강생의 답변과 동시에 빠른 타이핑을 해주시며 탁월하고 명료하게 잘 정리해주십니다. Hello! 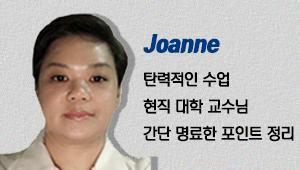 I'm Jo Anne. I graduated from University of Philippines in Diliman with the degrees of Economics and Philosophy. I used my academic background to be employed as an associate Professor in a community college, where I have been employed for the last 13 years. Aside from that, I have been teaching English for Secondary Language for almost five years and IELTS for three years online. I love to teach all kinds of students. They motivate me to become a better educator. 유보미 학생 수준 대응해서 유연하게 수업속도 맞춰주신듯 해요. 전 기본반 듣지만 기본적인것보다 fluency훈련이 필요했는데 책 내용 다 짚으면서 진도나가면서도 시험유형대비해서 많이 말하게 해주신 부분이 좋았어요. 융통성 있게 속도감있는 수업진행 해주신것도 좋았고 빠르고 정확한 첨삭 감사하고 전체적으로 수업시간이 일분일초 낭비없이 알찼어요. 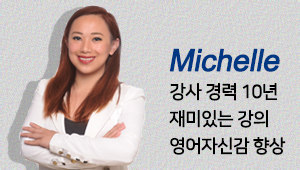 비몽사몽 새벽시간에 수업햇던지라 그런건진 몰라도 선생님 성격이 차분하시고 약간 건조하다 여길 수도 있지만 선생님 수업의 질이 괜찮습니다. 수강생분이 스스로 말할 수 있도록 유도하는 노하우를 갖추고 계십니다. 필리핀 로스쿨 출신이시기에 논리정연한 답변구성에 강점을 가지고 계십니다. 다채로운 아이디어로 여러분의 답변을 풍성하게 만들어드립니다. ------- Hi, I'm Juneva of Super English. I've been an online teacher for quite some time now. Throughout these years, I've learned so many ways on how to help you improve your English skills and achieve your target score in IELTS. Every day, you'll learn new expressions and techniques that will help you get at least 6.0 in the exam. On top of that, I’m very friendly, so you can relax and find it easy to learn and have fun in class. Join me in my classes and I’ll make it a point that you will learn something new by the end of each lesson. See you! 필리핀 최고의 대학교 UP 로스쿨 출신이기에 논리정연합니다. 정말 첨삭을 잘 해주셔서 최고의 아이엘츠 선생님이라는 평가를 받습니다. 수강생의 의도를 잘 파악하여 이해하기 쉽게 설명해주십니다. 본인의 역량을 테스트하고 높이는 것을 진심으로 즐기시는 학구파입니다. Hi. I am Teacher Leislie. 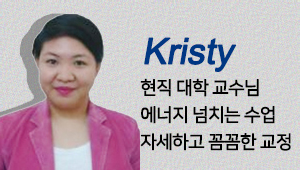 I’ve just realized that I have been teaching Koreans for more than a decade now. Those were long wonderful years. I think my passion in everything I do made me last in this industry. I am currently a civil servant but I just cannot give up teaching. I love learning many things and meeting people. When I don’t have work, I enjoy traveling a lot. I have a big heart for humanitarian activities too. In fact, it is one of the reasons why I decided to work with Cooperazione Italiana (Philippines),which is an IGO under Italian Government. I have also participated in iTeach Project (together with our Vietnamese counterparts) for poor and inaccessible highland areas in the place where I live. This is a United States funded project under YSEALI (Young Southeast Asian Leaders Initiative). 역시 슈잉의 원년멤버이자 자랑인 베테랑 선생님입니다. 수강생의 수준을 정확하고 면밀하게 파악하셔서 스스로 최대한의 능력을 파악할 수 있도록 이끌어줍니다. 내용은 동일하더라도 다른 형태로 쓰는 법, 다양한 표현법, 적절한 어휘를 중점적으로 지도해주십니다. 수강생이 말하고자 하는 바를 빠르게 캐치하셔서 자연스러운 영어로 만들어드립니다. 라이팅을 정말 좋아하는 쏙시 선생님은 프리랜서 작가경력을 보유하고 있습니다. 티칭에 대한 열정이 있는 쏙시 선생님과 아이엘츠 라이팅 수업을 추천해봅니다. Hi, my name is Socsy and I have been teaching English for almost a decade now. Before I discovered my passion for teaching, I worked as an accounting staff and a freelance writer. I decided to shift careers because I wanted to seriously pursue writing as a profession. It was then that I realized I also have a knack for teaching. I started out as an academy teacher at an English Language institute and I have been teaching since then. I still write during my spare time, but being an ESL teacher is now a huge part of who I am and teaching is something that I truly enjoy doing. 고득점 전문 선생님, 슈퍼잉글리쉬 원년 멤버이자 언제나 인기 만점 선생님. 미국시민권자 이며 캘리포니아의 중학교 영어교사 경력을 가지고 있습니다. 두말할 것 없이 슈잉의 간판 선생님으로 자리매김 하셨습니다. 수업은 꼼꼼하고 설명도 자세하게 진행되며 더 좋은 문장들을 익힐 수 있습니다. 수준 높은 답안을 구성할 수 있습니다. 오랜 경력으로 학생의 마음을 잘 알고 필요부분을 채워주는 베테랑 선생님입니다. Hello! Welcome to SuperEnglish. Are you looking for an English tutor to help you achieve your target IELTS score? Then allow me to take a few minutes of your time as I tell you a little bit about myself. My name is Teacher Yz. I have been an online English tutor for seven years now, six of those as an IELTS trainer of SuperEnglish, where we continue to improve our skills by receiving regular trainings from an IELTS examiner. Previous to that I was a classroom English teacher, and have experienced teaching both here in the Philippines and in the USA. I am an English major with a Bachelor’s Degree in Secondary Education and a Master’s Degree in Teaching English as a Second Language. When it comes to teaching IELTS, there are several things that I do that are very effective in assisting my students get higher IELTS scores. First, I always make sure that they have a clear understanding of the criteria involved in each type of test. A thorough understanding on how their speaking or writing will be scored during the test can really help us focus on how to maximize their strengths and improve their weaknesses. Second, I make it a point to teach my students the very crucial skill of organization. Whether it is in speaking or writing, the ability to think logically and present one’s ideas systematically can go a long way in helping a student secure a higher score. Also, when it comes to vocabulary, I help my students understand English words better, be able to differentiate nuances between synonyms and avoid the common error of using words inappropriately. Lastly, I also train them to identify and correct common grammatical mistakes. It has been said that learning English is like learning a musical instrument. Constant correct practice is the key to your success. Studying with a tutor who understands your needs and is equipped with the knowledge and skills of language teaching can make a huge difference in whether you will get your target score or not. So, if you are highly-motivated, willing to learn and not afraid to work hard, I will be more than happy to give you my best efforts and help you achieve your IELTS goals. 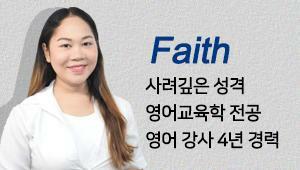 박윤희 선생님과 약 4개월정도 공부하고 있는 학생입니다. 우선 선생님이 매우 똑똑하셔서 학생의 의도 파악이 빠르시고요. 미국 생황을 오래 하셔서 발음에도 부족함이 전혀없습니다. 현재 롸이팅, 스피킹 수업을 받고 있는데 롸이팅은 아이엘츠 "시몬" 선생님과 같이 간결하고 어렵지않은 논리적인 글쓰기 방법을 알려주십니다. 스피킹은 진도를 빨리 나가는 것이 아닌 최대한의 실수를 줄이게 반복연습을 하게 해주십니다. 친화력이 매우 좋으셔서 적응하시기 쉬우실꺼예요~ 작년 10월 이후로 몇몇 선생님들을 거쳤는데 저는 YZ 선생님이 제일 잘 맞는것 같아요. 우리 선생님 완전 강추 강추 입니다. Hello. I am Michelle a SUPER IELTS teacher from Baguio City. First, Let me help you understand the bandiscriptor of your target score. The technicalities of grammar, vocabulary, pronunciation, fluency and coherence are helpful to achieve higher bands in IELTS. Second, We will learn new words/patterns and expressions that you can use to achieve the standard of IELTS. Third,Let me help you build your confidence.Your confidence is important as it will help you express your opinion easily and be sound convincing to your examiners. Fourth, Let's practice together. There's no skill or ability that is mastered overnight.So allow me to help you to be better at these skills. Fifth, Learning must not be stressful, but fun. Yes! Yes! Yes! You won't feel dull in my class because we are going to make it fun. So, what are you waiting for. Let's learn and have fun learning IELTS in a stress-free manner together.